alaTest on kerännyt ja analysoinut 2690 arvostelut tuotteelle Kodak Playsport ZX3. Keskimääräinen antama arvosana tälle tuotteelle on 3.8/5, verrattuna keskimääräiseen arvosanaan 4.0/5 kategoriassa Videokamerat. Me analysoimme käyttäjien ja ammattilaisten antamia arvosteluita, tuotteen ikää ja muita seikkoja. Verraten muihin tuotteisiin kategoriassa Videokamerat, Kodak Playsport ZX3 on saanut alaScore™-arvosanan 88/100 = Erittäin hyvä. Kodak goes ruggedly underwater with its latest pocket Internet camcorder. But does it sink or swim? The $150 Kodak Playsport Zx3 Video Camera fits in your pocket, captures 1080p footage and 5-megapixel still images—and you can take it in the pool. Excellent value. Waterproof up to 10 feet. Sturdy build Simple user interface. Versatile capture options including 5-MP stills. Small, 2-inch LCD. No macro focus. No microphone input or headphone jack. Looking for a video recorder for your trips out of town? The new PlaySport Zx3 is a viable option if you're on a budget. 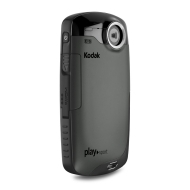 As the name suggests, the Kodak PlaySport Zx3 is a ruggedised camcorder that is geared up for outward bound pursuits. The Kodak Playsport Zx3 is a waterproof (up to 10 feet deep) pocket camcorder that makes excellent videos and photos, though it has one design flaw. The Kodak Play sport which is also referred to as the Zx3 isn't half as bad as the previous models of camcorders available in the market.